A track fire on the B and Q line sent black smoke billowing into the sky Monday morning and delayed Brooklynites heading into the city. PROSPECT-LEFFERTS GARDENS, BROOKLYN -- A track fire at the Prospect Park station brought B and Q trains to a screeching halt Monday morning, according to MTA officials. Firefighters rushed to the station on Lincoln Road near Flatbush Avenue at about 9 a.m. to put out a fire on the northbound B and Q tracks, MTA officials said. B and Q trains were temporarily rerouted to the D and N lines as the MTA turned off the third rail and firefighters extinguished the blaze. Transit officials restored service by 10 a.m. but warned straphangers to expect residual delays. The fire comes after more than a month of weekend shutdowns of Q train service so that MTA workers could make necessary track repairs, a fact that frustrated several stalled straphangers. "So the Q is down all weekend and now first thing Monday morning this is what we get??" 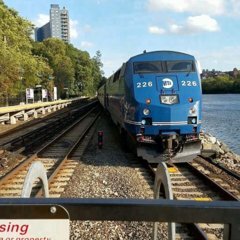 Rob O'Neill tweeted to the MTA. @Commutehell added, "Thanks for making us all late after shutting down the Q all weekend." Anybody aware of the cause of the fire? Bushes, trash, etc...? I assume it's trash but I can't find it out for sure as of now. Anybody aware of the cause of the fire? I can't find it online as of now. It says there was a track fire. The being knocked out on weekends has really been a pain in the @ss. I was on the Upper East Side yesterday and had to start thinking how I'd get over to the West Side. Thank God they re-routed the but traveling in Brooklyn has become almost unbearable on weekends. The trains are so damn packed and the crawwwwlll. I get a break from that next weekend if I skip the barber. All the evidence was burned.